THE WORLD’S fifth-largest continent, Antarctica is home to the South Pole. This continent of almost 98 percent ice and 2 percent barren rock holds the distinction of being the coldest, windiest, driest, and highest continent. Antarctica covers some 5.4 million square mi (14 million square km), and has no indigenous people, but seasonal staff from 1,000 to 4,000 people. The continent’s highest point is Vinson Massif at 16,066 ft (4,897 m) and lowest point is the Bentley Subglacial Trench at -8,382 ft (-2,555 m). Frequent, gusty winds blow from the interior sections toward the coast, and blizzards are common along the foot of the plateau. Volcanoes are scattered along areas of West Antarctica, and large icebergs frequently break off from the ice shelf. Cold temperatures are spread across the continent. 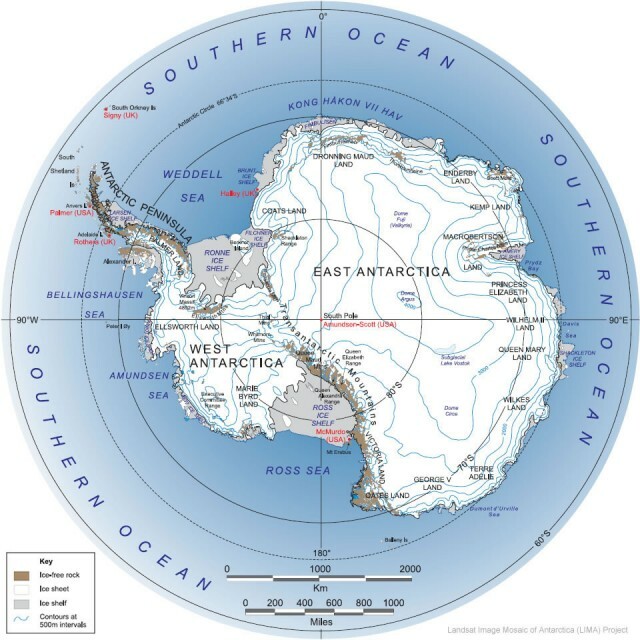 The higher elevations of East Antarctica provide the coldest temperatures. A more moderate climate is found on the Antarctic Peninsula, where high temperatures average closer to freezing. Although the climate is incredibly harsh and dry, plant species, albeit small in size, are numerous. Hundreds of algae species are scattered across the land, as well as around 100 species of moss, 350 species of lichen, and 2 grass species. The subantarctic islands surrounding Antarctica have a wider range of flora. About 45 bird species populate the area south of the Antarctica Convergence, and a few penguins and petrels actually live on the continent. The waters surrounding Antarctica are full of seabirds, fish, seals, and whales. The continent remained untouched by humans until the 19th century. In 1773, British sea captain, James Cook was the first to cross the ANTARCTIC CIRCLE, but never saw any of the landmass. Almost five decades later, in 1819, the Russian naval officer Fabian von Bellingshausen discovered some of the islands. However, it was not until a year later that British naval officers William Smith and Edward Bransfield discovered the landmass. A few months later in November 1820, an American sealer, Nathaniel Palmer, also discovered the continent. In 1822, another American sealer, Captain John Davis, became the first person on record to land on the continent. For the remainder of the decade, British, French, and American expeditions navigated the land and proved that Antarctica was indeed a continent. In 1838, Lt. Charles Wilkes of the U.S. Navy explored some 1,200 miles of the Antarctic Peninsula. From the late 19th century until 1916, explorers across the world were engaged in a race to see who would first reach the South Pole. In 1902, the British explorer Captain Robert Falcon Scott led an expedition to Antarctica with Ernest Shackleton and Edward Wilson. They were forced to abandon the adventure because of the harsh conditions and scurvy. Five years later, Shackleton attempted to travel to the South Pole, but within 97 mi (156 km) of the South Pole, his supplies dwindled and he had to abandon the effort. On December 17, 1911, the Norwegian explorer Roald Amundsen and his team of four were the first to reach the heralded South Pole. Almost one month later, on January 18, Captain Scott and his team successfully reached the South Pole but found the claim marker the Norwegians had left. The Norwegians left the ice continent ahead of the British explorers and from Tasmania sent a telegram proclaiming to the world that they had found the South Pole. Scott and his crew, unfortunately, died from the harsh conditions and lack of food, while heading back to the coast. No humans set foot on the South Pole again until 1956. From July 1957 to December 1958, 12 nations established over 60 polar stations in Antarctica. In 1959, the Antarctica Treaty was created by the nations having an interest in the continent. It outlined certain conditions in maintaining the natural environment, and stated that the land could only be used for peaceful purposes. Nuclear testing was outlawed as well as dumping nuclear waste. By 1961, the terms of the treaty were made into international law, and since then, seven nations’ claims of sovereignty of the Antarctic have been suspended. Dotted across the continent are polar stations; it is obvious that Antarctica has become a haven for explorers and scientists. Antarctica remains a continent untouched by any industrial machine. However, the effects of overall global pollution are evident in the sky above. The ozone hole over the continent has expanded, and ice shelves have begun to disintegrate. In 1997, a Norwegian, Boerge Ousland, became the first person to cross Antarctica alone. The continent remains a mysterious and beautiful area for scientists conducting experiments and for explorers in testing their endurance in some of the harshest conditions on Earth.